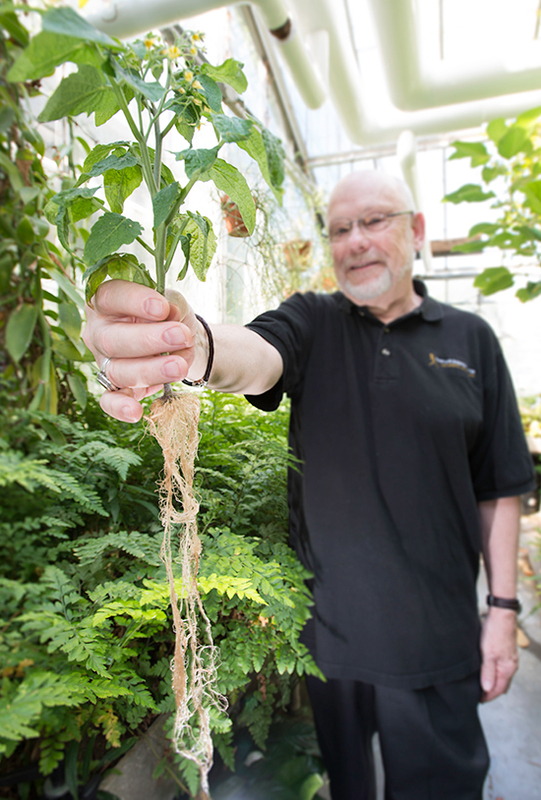 Roots play a key role in regulating where sugar ends up in plants like tomato. Plant scientists are borrowing a tool from medicine to unravel how plants fight off an attack. The Schultz-Appel Chemical Ecology lab used PET scans to decipher how and when a plant uses resources to fight off a disease or insect. Positron emission tomography (PET) scans detect radioactive tracers and how they travel over time. In humans the scan tracks blood flow to find cancers, understand brain activity and show uptake of drugs in preclinical trials. 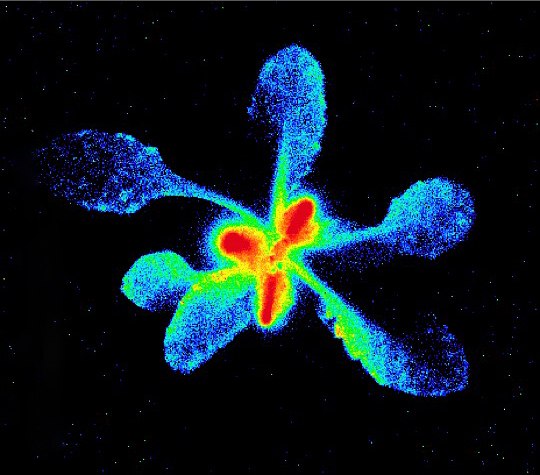 In plants, PET scans shine light on how plants divvy up sugars to protect against attackers. Young leaves are of particular interest. They attract pests because they are full of the nutrients while also being more vulnerable to attack. These youngsters can’t photosynthesize enough sugar to build chemical defenses for themselves, so they get sugars elsewhere through the phloem, part of the plant’s transportation system. Abbie Ferrieri, a former doctoral student in Schultz’ lab, wondered if these old leaves were supplying young leaves directly or otherwise. Using Arabidopsis thaliana, she worked with Brookhaven National Laboratory to investigate using PET scans. This mustard plant is commonly used as a model in research because of its relative simplicity and the breadth of knowledge about its inner workings. This image shows radioactive sugar concentrations 2.5 hours after tracer molecules were fed to older leaves in the plant. The red color indicates high levels of beta particles as those sugars emit radioactivity. Concentrated in young leaves, the image indicates that these fast-growing young leaves draw the radioactive sugar from the older leaves. This PET scan technique is similar to how doctors detect some fast-growing cancer tumors. First, she fed radioactive sugar – 2-[18F]fluoro-2-deoxy-d-glucose – to old leaves on the plant. Then she injured young leaves with a mechanical wheel and introduced methyl jasmonate to the wounds. Methyl jasmonate works as a chemical signal, telling other parts of the plant that an attack is happening. The researchers took PET scans to determine where these sugars traveled. Ferrieri found that most sugars travel to roots and also to leaves in a line above and below them, a connection called orthostichy, in the injured plant. But, three hours later, PET scans showed that radioactive sugars migrated to the attacked leaves regardless of whether they were in the same row on the stem. Damaged leaves then used those sugars to make phenolic glycosides, compounds that help defend the leaf. Using the more short-lived radioactive tracers, Ferrieri saw leaves send sugar to the roots within minutes of an attack on nearby leaves. But 24 hours later, damaged leaves started receiving more sugar. This change in sugar flow and its control is a continuing curiosity that scientists like Schultz want to decipher. Schultz’ lab knew from previous research that an insect chewing on a young leaf triggered an enzyme called invertase to break down sugars faster and call for more. But, Ferrieri thought roots might play a bigger role in controlling sugar. To test her theory, she decided to shut the roots of her plants down using ice water. Plant scientists have been playing with radioactive particles for decades. Researchers like Melvin Calvin used radioactive carbon in the 1940s to figure out how plants capture carbon dioxide for photosynthesis. But, this field focused more on medical applications until the past decade when plant research received renewed interest. “The focus has changed a bit to move more into general biological and not just nuclear medicine,” said Silvia Jurrison, an MU professor of chemistry who works to find better uses of the technology. Bond LSC labs – including those of Gary Stacey, Paula McSteen and Jack Schultz – collaborate with Jurrison to use radiotracers to explore plant processes. Jurrison hopes new compounds will make that easier. While research in Schultz’ lab works to explain basic plant processes, it one day could lead to new advancements. It could help sequester carbon to slow global warming or be used to better protect future crops from pests. “Plant defense’ effectiveness depends not only on what they are made of, but also how fast and how strongly they can respond. Anything you can understand about how a plant defends itself against pests is potentially useful,” Schultz said. The Department of Energy’s Biological and Environmental Research division funded this research. Ferrieri now works at the Max Planck Institute for Chemical Ecology in Germany. Read more about some of this research in the journal Plant Physiology. 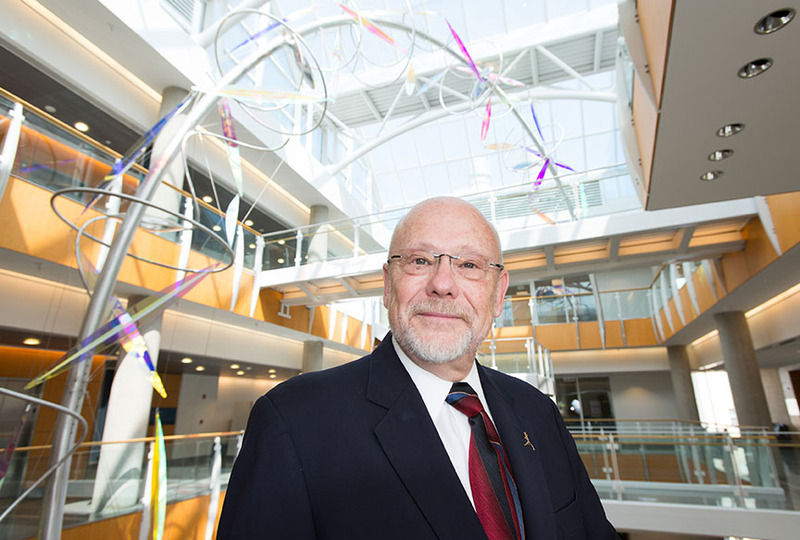 Jack Schultz is director of the Bond Life Sciences Center. 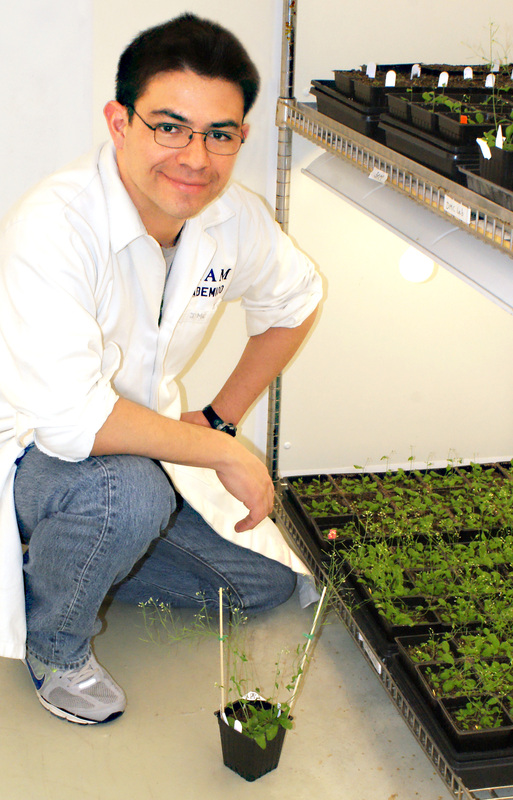 David Mendoza-Cozatl uses Arabidopsis plants like these as a model to understand how plants transport nutrients from soil to seeds and leaves. Forget fruits and vegetables, seeds provide a critical part of the average person’s diet. From beans to cereal grains, understanding how genes and soil types impact nutrition could one day help produce more nutritious food. One University of Missouri researcher wants to know which genes control the elements in these nutrient-rich packages. In a five-year collaboration with researchers at the University of Nevada and UC San Diego, the group measured the amounts of 14 elements in both plant seeds and leaves of mutant Arabidopsis thaliana plants planted in different soil types (salty, alkali, heavy metal and normal). These mutants were special. Each plant had a different gene disabled, allowing researchers to tell if the disabled gene affected uptake of minerals into the seeds or leaves. The teams found that 11 percent of genes influence proteins relevant to the nutritional content in seeds. Soil types also played a role in the significance each gene’s impact. The approach could be likened to understanding how a car works. Mendoza-Cozatl’s work with the group focused on soil laced with non-essential heavy metals (e.g. cadmium and arsenic). They grew mutant plants from seeds and compared nutrient content of those plants’ leaves and seeds to a baseline. To do this, researchers “digested” leaves and seeds, separately, then quantified the amounts of elements. This surprised him since nutrients in seeds come through the leaves via the phloem. The phloem is living tissue that transports nutrients throughout a plant. Nutrition isn’t the only area that could benefit from knowing what controls the transport of minerals in plants. A newly engineered plant could be made to use less fertilizer or move particular types of minerals, like toxic heavy metals. Genes identified through this study will lead to new research in the Mendoza lab as well as other labs involved in this large project. A grant from the National Science Foundation funded this research. Mendoza-Cozatl is an assistant professor of plant sciences in MU’s College of Agriculture, Food and Natural Resources and a member of MU’s Interdisciplinary Plant Group. Read details about the research in the science journal PLOS ONE.